This years Ash Wednesday in Rome is all about the demise of Pope Benedict XVI., who retires at the end of February from the highest office of the Catholic Church. In the evening, after the general Audience, the Pope celebrated his last Ash Wednesday liturgy before numerous church dignitaries and thousands of believers. He was greeted with thunderous applause. In his sermon Benedict XVI. issued a call for renewal and conversion during Lent the worshipers. This just serves to renew the conversation and concrete actions. “Today, many are ready to tear down their clothes in the face of scandals and injustices – which were of course committed by others – but few seem only willing to work on one’s own heart, one’s own conscience and their own intentions, and thereby leave the conversion, renovation and conversion to the Lord, “said Benedict XVI. It is important to remember this and to live that this Lent: Everyone should be aware that the path of penance could not be overcome alone, but together with the many brothers and sisters in the Church, the Pope said. The worship service on Ash Wednesday was to be laid in St. Peter’s Basilica, as the Vatican expected large crowds – not for no reasons – hours before the start of the Ash Wednesday Liturgy, there where longs queues in St. Peter’s Square. In the Mass, the Pope was received with applause by the enthusiastic attendees. “I thank you, let us now return to prayer,” he said after a while. Before the Mass, Benedict had thanked Catholics throughout the world for their support, at one of his last general audiences before his announced resignation. “Continue to pray for me, for the Church and the future Pope,” he said in front of thousands of faithful. He also explained the reasons which led to his decision. It was decided in “full freedom” for the good of the Church, Benedict stressed before thousands of faithful in the Nervi Hall. He had become aware that he could no longer continue papacy with the necessary power. “The pontificate of Benedict will come to an end with a dinner on 28th February in Castel Gandolfo, so without an official final stroke”, said Lombardi. 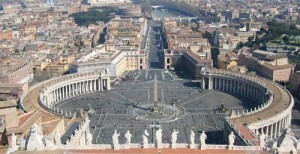 “The Pope will fly to the Vatican by helicopter from the papal residence south of Rome at 5:00 p.m. (CET). After dinner, he will probably pray in the chapel and greet all present, all with great normalcy.” The pontificate ends at 8:00 p.m. (CET). This entry was posted in Pope Benedict XVI and tagged Ash Wednesday, Benedict XVI, Catholic Church, church unity, future pope, Holy Mass, mass, Pope, pray, prayer, renewal and conversion, sermon, St. Peter's, worship service, worshipers by Osservatore. Bookmark the permalink.